UPDATE: Naim n-Stream control app for UnitiSystem now available | What Hi-Fi? 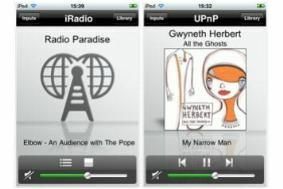 Running on the iPod Touch and iPhone, n-Stream allows input selection, browsing of network music libraries, control of devices connected to the Unitis' USB input, and selection and presetting of DAB, FM and internet radio stations. It requires a wireless network, and either a NaimUniti running firmware 3.00.00 or above, or a UnitiQute. Owners of NaimUniti should contact their local Naim dealer for information on how to check the firmware version of their unit. We'll be testing the Naim UnitiQute. complete with the app, in next month's issue, on sale September 17, and for the chance to win a complete Naim UnitiSystem, worth nearly £5500 and comprising a NaimUniti, a UnitiQute, a UnitiServe and a voucher for the n-Stream app, click here. Posted 16.06.10: Naim is demonstrating its complete UnitiSystem at the CEDIA Home Technology Event trade show, now running at ExCel London – and it's announced the impending arrival of an iPhone/iPod Touch app designed to give complete control of the Uniti components. On show at the event in Docklands is the original NaimUniti, the UnitiQute player and the UnitiServe hard disk player/streamer, along with demonstrations of the app. The company says of the system that it 'delivers flexibility, ease of installation and performance to the consumer. The clever part, however, is that should the owner decide later that NaimNet is the ideal solution to the family needs the UnitiSystem products will completely integrate. The NaimUniti sells for £2100, and the UnitiQute will be available soon for £1350, along with the UnitiServe for £2000 and the control app for £25. We'll update you as soon as the app is available.